The amount of data in the cloud has grown and shows no signs of stopping in 2017. As a result, higher-end web services such as big data, machine learning and serverless computing will become the new battleground for top cloud providers. Leading public cloud providers including Amazon Web Services (AWS), Azure and Google have recently added machine learning capabilities to their infrastructure as a service (IaaS) offerings, to bring the technology into the mainstream. Google, specifically, made a big push toward machine learning with new services for image and speech recognition earlier this year, and AWS also unveiled a number of new machine learning services at its re:Invent conference in November. Increased adoption of serverless computing environments, such as AWS Lambda, also tops experts' cloud computing predictions for 2017. "Emerging serverless architectures, such as AWS Lambda and Google Cloud Functions, will also be key components for us, giving us even more independence from server management and increased flexibility in our deployment architecture," said Dave Tucker, vice president of engineering at Workiva, a financial services software provider in Ames, Iowa. 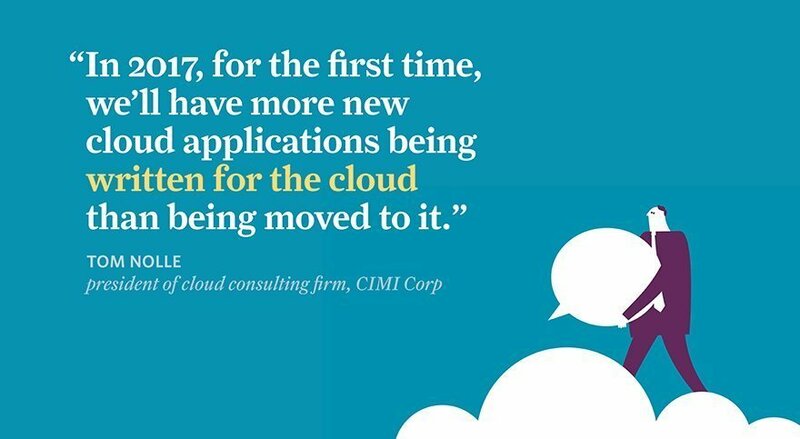 As top cloud providers push these higher-end services such as big data and serverless computing, more organizations will write new applications specifically for the cloud, versus just migrating existing apps to the cloud, said Tom Nolle, president of cloud consulting firm CIMI Corp. and a TechTarget contributor. "In 2017, for the first time, we'll have more new cloud applications being written for the cloud than being moved to it," he said. "This is driven in part by the cloud providers adding features as web services, including areas like mobility, internet of things and AI, and in part by enterprises' needs to optimize cloud use by designing cloud-specific applications." How does your enterprise use machine learning in the cloud?